There are many ways to find your strengths. One of the keys is to focus on where you have natural self-discipline. Let’s explore how you can build on where this happens for you. “People say I have a strong work ethic, but I am simply doing what I enjoy,” said one of my mentors, who ran a therapeutic community for troubled young people. It was quite natural for him to get up early in the morning, make breakfast for twenty people, teach lessons during the day, lead group meetings during the evenings and deal with crises late into the night. Why? He was doing what he loved, but this went further. He had a natural feeling for the activity and was also a good finisher. He did not mind doing the grunt work, as long as it contributed to achieving the great work. Looking from the outside, he appeared to have great discipline. But he maintained this was simply the result of following his vocation. What are the specific activities in which you have natural discipline? You may show it when encouraging people, gardening, writing, renovating houses, fixing certain problems or whatever. 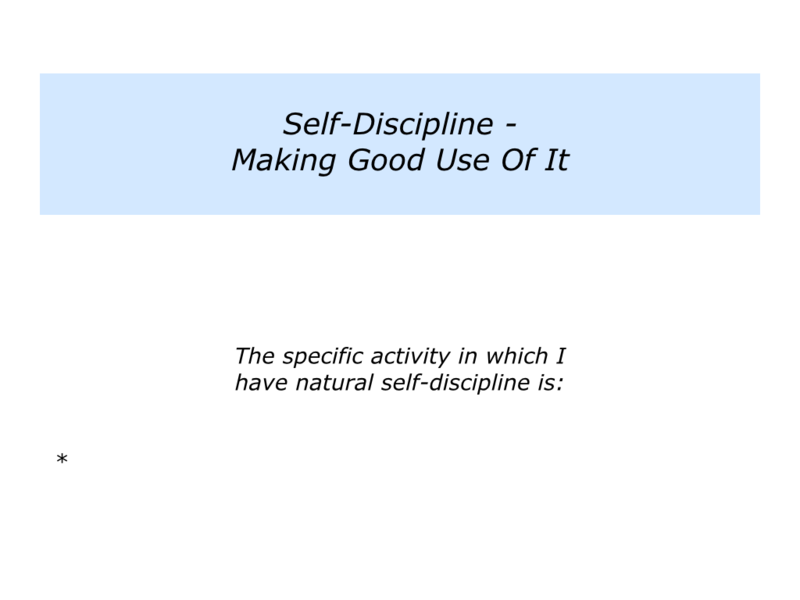 Describe the specific activity in which you have natural self-discipline. 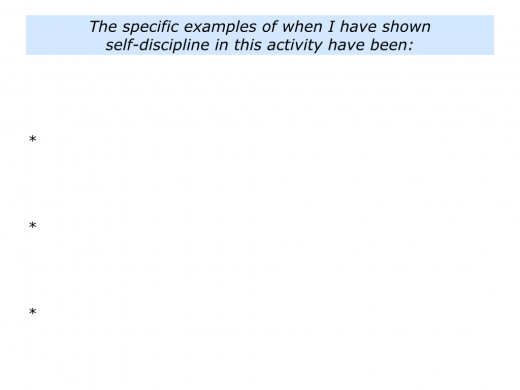 Describe the specific examples of when you have shown self-discipline in this activity. Peak performers often have a positive form of OCD. 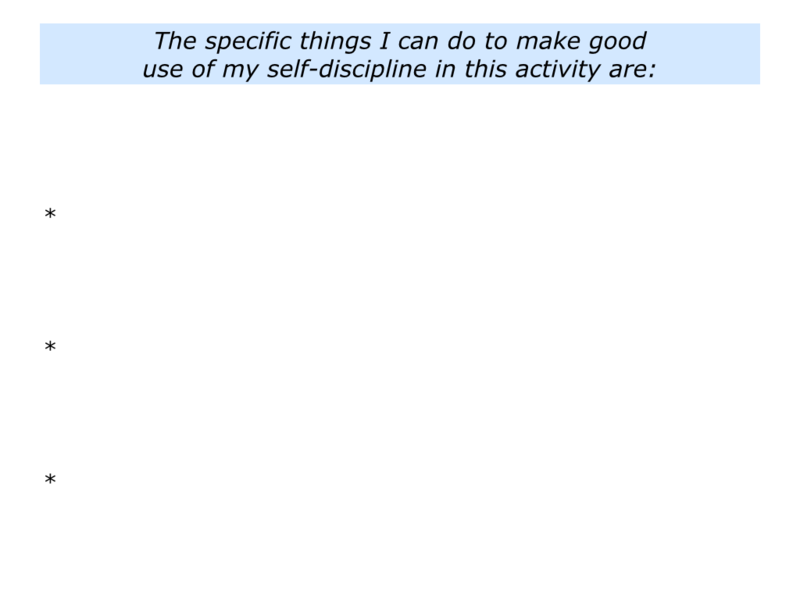 By this I mean Obsessive Compulsive Discipline rather than Disorder. 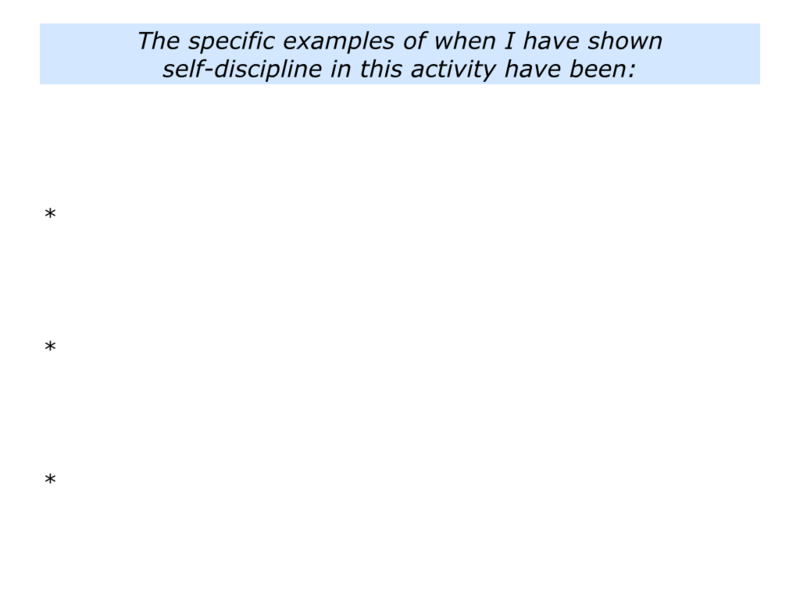 They tend to be obsessively disciplined in the activities where they excel. Such people know how to use this obsession, however, rather than be used by it. Once I was asked by a retail chain to identify the characteristics of their great store managers. “I get into the store two hours before everybody else. After organising my day, I walk the store, making sure everything looks perfect. Peak performers have natural discipline in the areas where they are brilliant. 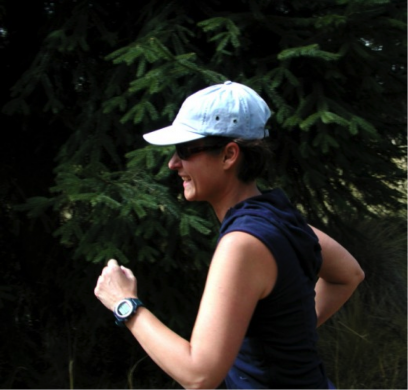 They may be obsessive about exercising, running aspects of your business, rehearsing what will happen during the day or whatever. Such people love to make lists and enjoy crossing off each item. They organise things to, as far as possible, create predictability. This gives them freedom to respond when the unexpected happens. How can you harness this ability? If you wish, try tackling the exercise on this theme. This invites you to do the following things. 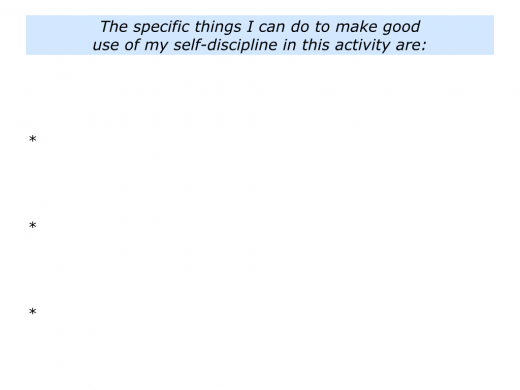 Describe the specific things you can do to make good use of your self-discipline in this activity. Great workers use their self-discipline as the springboard for developing a daily working rhythm. Passion provides the starting point, but persistence is required to reach their goals. This calls for developing good habits. 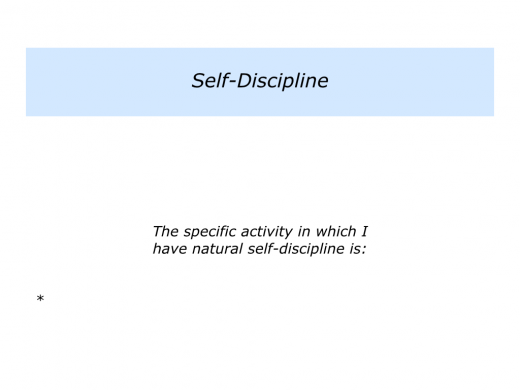 Many habits stem from their self-discipline, but some can be developed. They may need to learn to say ‘Yes,’ to pursuing their compelling goal and ‘No,’ to other distractions. Great workers plan their days properly so they can follow their self-disciplines. They protect their prime times – the times when they have most energy – and use these to do fine work. 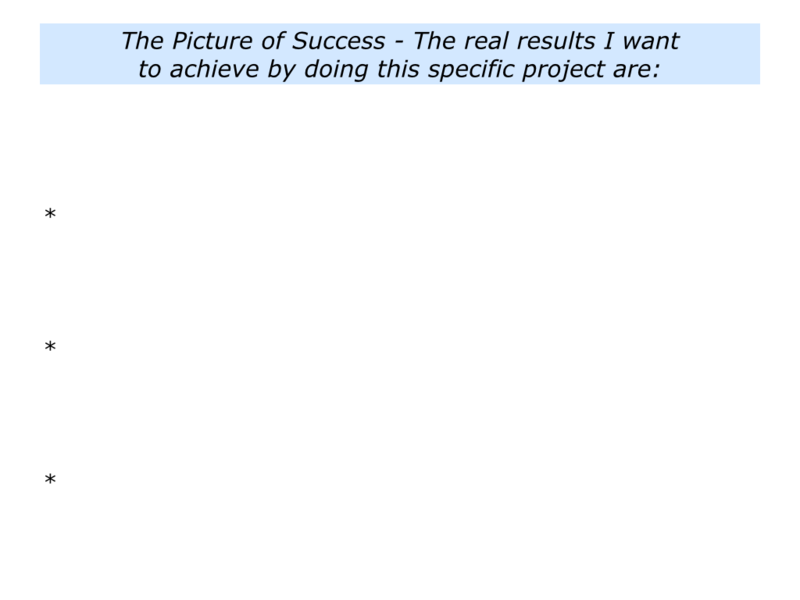 They then keep doing the right things in the right way to get the right results. How could you follow this approach in your own way? If you wish, try tackling the exercise on this theme. This invites you to do the following things. 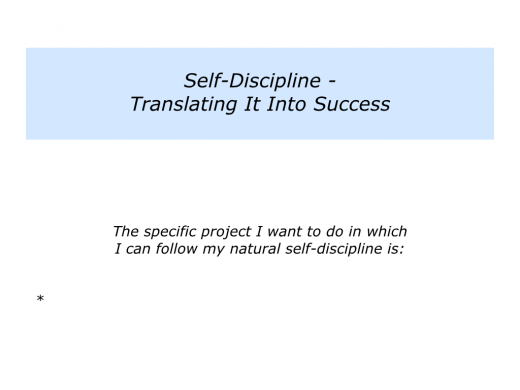 Describe a specific project you want to do in which you can follow your natural self-discipline. 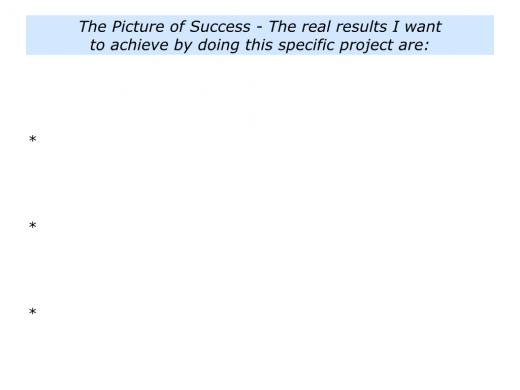 Describe the picture of success – the real results you want achieve by doing the specific project. 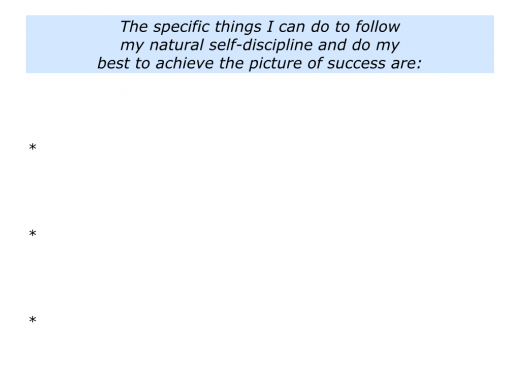 Describe the specific things you can do to follow your natural self-discipline and do your best to deliver the picture of success.